Beautiful mehendi designs are not just meant to beautify our hands! One can also apply them gracefully on their feet. In fact, as per Indian traditions, a bridal mehendi is all about decorating hands, full arms, feet and half legs with gorgeous henna patterns. The designs on the feet (and legs) can be in sync with the pattern drawn on the hands or may not be in coordination. This decision has to be taken by the bride. Of course, the mehendi of hands and feet should not look so different that there is not a single cohesive element that binds the designs together! Zuri has carefully selected 18 gorgeous mehendi designs which are versatile, can be worn with any mehendi style drawn on one’s hand, famous designs, and different occasions. From bold ankle stains to delicate feet patterns, from a rich, traditional design to a quirky Arabic one, we have got them all. Some of these designs are minimalist in their representation. They look stunning with a pair of payal (anklet) and toe rings. You can opt for an elaborate-mesh look or sport an intricate Rajasthani circular motif for a heavy-bridal look. You can also fuse an Indian design with the Arabic styling for an elegant Indo-Arabic mehendi pattern. The most popular and traditional mehendi designs for feet include floral vines, paisleys, and peacock’s feather stretching from the toe finger and going up till the knee. For a simpler look, we recommend equally simple geometric patterns at the center of your foot with a pattern along the edge for bordering. Spirals ending in dots also look pretty chic. Add an embellished touch to the design by throwing in some glitter and sparkle. The trend these days is of abstract designs, featuring geometric shapes, motifs, and symbols placed strategically to give a beautiful overall look. A mehendi band pretending to be an anklet or much smaller ones on the toe fingers which can be mistaken for a simple toe-band, adorning your foot like jewels. Now, isn’t that such a visual treat? If nothing else, on a hot summer day, just bring down your body temperature by applying mehendi paste on the surface of your feet. The ultra-cooling effect of henna paste is extremely relaxing. 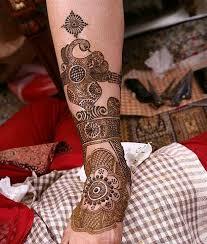 Take a look at some of the best mehendi designs for feet. Tell us which one is your favorite?